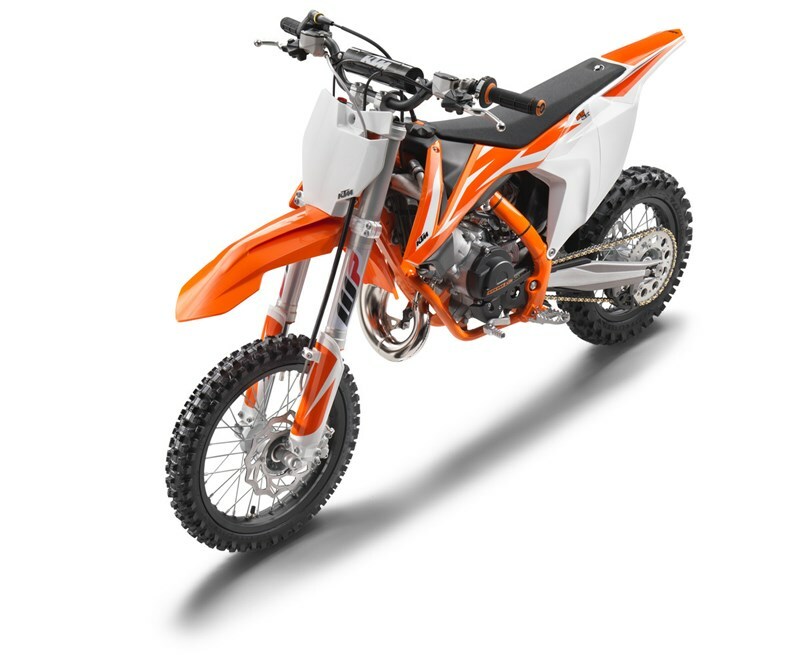 The high performance cylinder features the pressure controlled exhaust valve (PCEV) and provides an unrivaled performance within the highly competitive 65 cc class. An outstanding feature of the 65 SX is the hydraulic clutch made by Formula. It ensures an easy clutch action and well-defined modulation. The modern frame produced by WP Performance Systems is made of lightweight, high strength chromoly steel profiles and combines maximum longitudinal stiffness with optimum torsional rigidity. It guarantees easy handling and precise cornering, but also outstanding stability. The subframe is made of lightweight aluminum, just like the full-sized SX models. The classy anodized handlebar made of a high quality aluminum alloy is distinguished by the best ergonomics and the highest strength. An intelligent cooling circuit with integrated crankcase cooling and two radiators improves the heat dissipation and ensures a constant temperature balance for consistent, high performance. Derived from the full-size SX bikes, the graphic design makes the new 65 SX look even cooler. Its frame has a super rugged polymer coating in cheeky black. 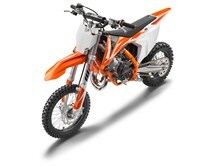 The 65 SX is fitted with a lightweight cast aluminum swingarm. Conceived using the latest in calculation and simulation software, the design and wall thickness have been made for minimum weight at optimum stiffness and precisely defined flexibility. In addition it features a robust 2-compound chain guide similar to the full-size models. The new 65 SX is the first model in its class fitted with a modern, fully adjustable air fork: the AER 35, made by WP Suspension. Beside a massive weight reduction of 1.6 lbs, the newly developed upside-down front forks with 35mm tube diameter and 215mm of travel ensure outstanding comfort, damping characteristics and directional stability. Another main benefit for junior riders is that the air spring fitted in the left fork leg can be adjusted perfectly and simply to the rider’s weight just with an air fork pump. On the rear wheel a WP shock absorber linked directly to the swingarm provides excellent damping performance and is fully adjustable in order set the damping perfectly to rider’s preferences and track conditions. The rear wheel travel is 270mm. The 65 KTM SX is fitted front and rear with massive 4-cylinder calipers that grip lightweight Wave brake discs of 198mm front and 160mm rear diameter. The hydraulic brake system is easy to control and ensures the best deceleration and the highest standard when it comes to feel and force.